Bottega Italiana-Amazing Gelato in Seattle! On my summer day trip to Seattle last month, we stopped for some gelato at Bottega Italiana which is pretty much right next to the Pike Place Market. It’s about a block away. 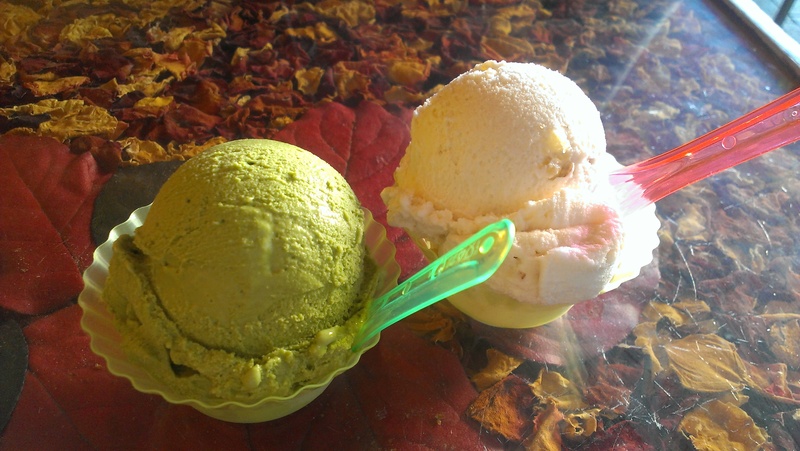 As with many other gelato stores, they make everything on site daily with fresh natural ingredients. It’s a lot cheaper than Vancouver! They also offer affogato. This entry was posted in Desserts, Food Reviews and tagged desserts, gelato, ice cream, Seattle. A new waffle place opened up where Death by Chocolate used to be on the corner of Fir and Broadway. My friend who was craving waffles suggested IHop and I’m just like no… after some research I found Belgium Place! It’s got the word Belgium in it so they should make good waffles right? They also serve some soups and sandwiches too. The cafe space has a lot of wood furnishing and they also have a shelf with a few French kid’s books. It doesn’t seem too busy so it could be a nice place to chat with some friends. The waffles are all Liege waffles and cost $3.80 plain. They also have waffles with chocolate and waffles with chocolate and almonds. and they are both $4.75. 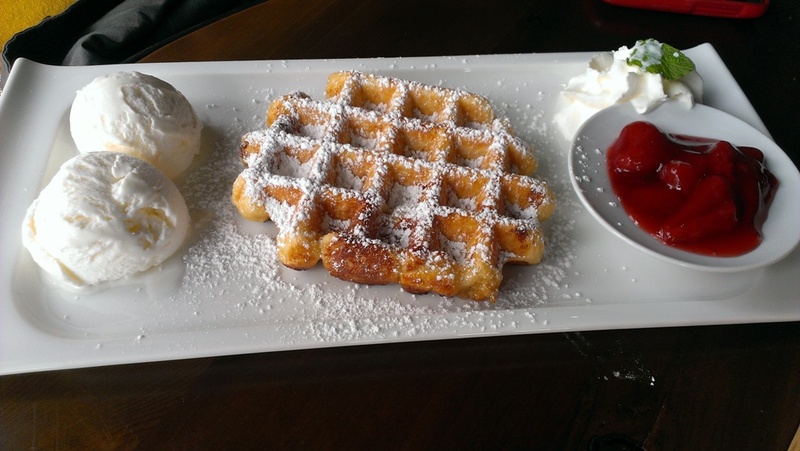 This was the Waffles with Strawberry and it was one of the special creations on the menu. It was served with 2 scoops of vanilla gelato and strawberry compote with a side of whipped cream. The size of the waffle was pretty big! Price wise it’s a bit cheaper than some other waffles joints coming in at $7.80 but pretty close. This entry was posted in Desserts and tagged almonds, chocolate, desserts, gelato, ice cream, liege waffles, nutella, waffles, whipped cream. First stop was gelato! 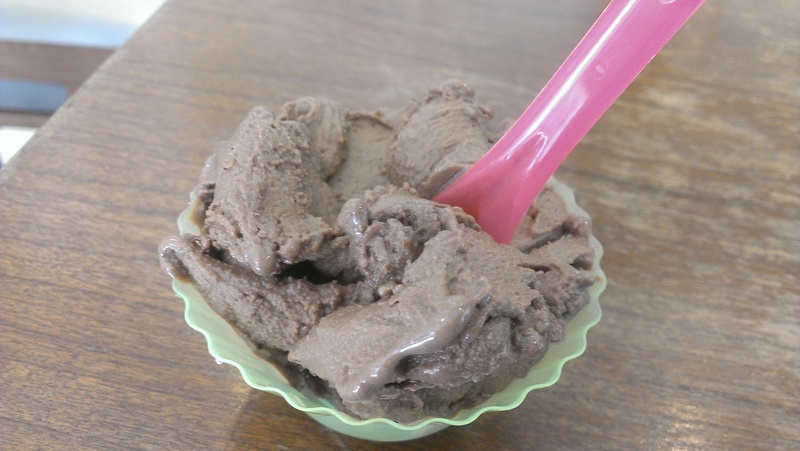 There are a few gelato places in the public market as well as two other places you can get ice cream/gelato from. We went to Omi Gelato and there was a huge line up! Pricing was $4.30 for a single scoop and $4.75 for a single with a waffle cone. 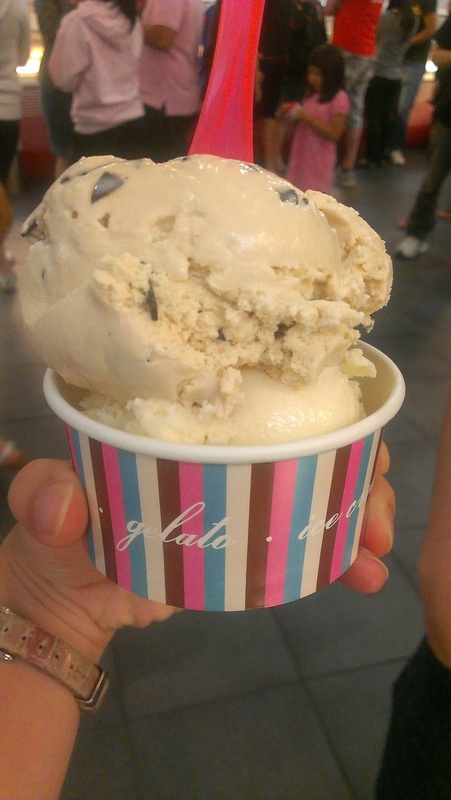 The gelato was not bad, nothing ground breaking but it satisfied our cravings and the scoop was really big! The waffle cones also tasted fresh. Flavours from left to right: Pistachio, Chocolate Hazelnut and Tiramisu (better image below). Sorry the pictures aren’t great because there were tons of people around and it started melting! This entry was posted in Desserts, Fast Food, Food Reviews and tagged calamari, desserts, fish and chips, gelato, Granville Island, smoothies. One scoop costs $3.57 which is about average. If you want a waffle cone, it will set you back another 50 cents. On the left we have Japanese Green Tea and on the right we have Maple Walnut. The green tea was packed with matcha flavour and if you love green tea, this will make you a happy camper! The Maple Walnut was sweet with maple flavour and there were a few nuts to give it some texture. These were good-sized, creamy scoops of gelato. They weren’t particularly special but it was still good enough for me. This entry was posted in Desserts, Food Reviews and tagged desserts, gelato, GI Gelato & Coffee House, green tea. Summer is probably the best time for gelato and La Casa Gelato has been on my list forever. Sure I went once when I was 10 but that doesn’t count anymore. La Casa Gelato has over 518 flavours and counting according to their website. I knew that it would take me forever to decide on what to order. When my friend and I arrived around 10pm the store was still buzzing with over 20 gelato-craving customers. This is how it works: First you go up to the counter and pay first. Then they give you a coloured chip that you will give to the servers once you’re ready to place your order. Meanwhile, you are free to sample as much as you’d like! I was surprised that the samples they gave you were pretty big. I felt like I sampled at least one scoops worth of ice cream before I ordered! My friend ordered Straciatella (bottom) and Creme Brule (top). After much debate, I ordered the Banana with Chocolate Covered Marshmallows (bottom) and Hazelnut Frangelico with Chocolate Shavings (top). La Casa Gelato actually has a monthly contest where you can enter to win a $25 gift card to their store. Enter here for your chance to win! What’s better than free gelato? This entry was posted in Desserts, Food Reviews and tagged desserts, gelato, La Casa Gelato. 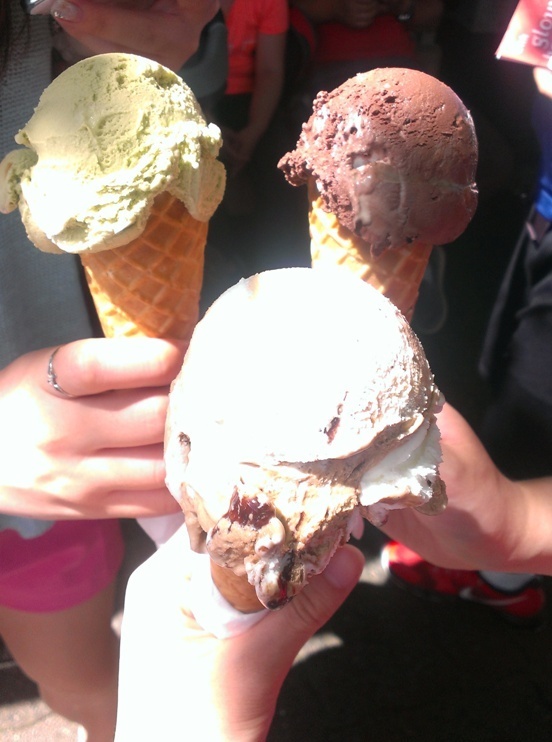 Summer is the perfect time for ice cream and gelato right? That’s why I couldn’t pass up the chance to try Bella Gelateria when I happened to pass by after an interview. Actually I lied. Any time is a good time for ice cream! =D I’ve heard about all the awards that this gelateria has won and I was curious to see how good it was. 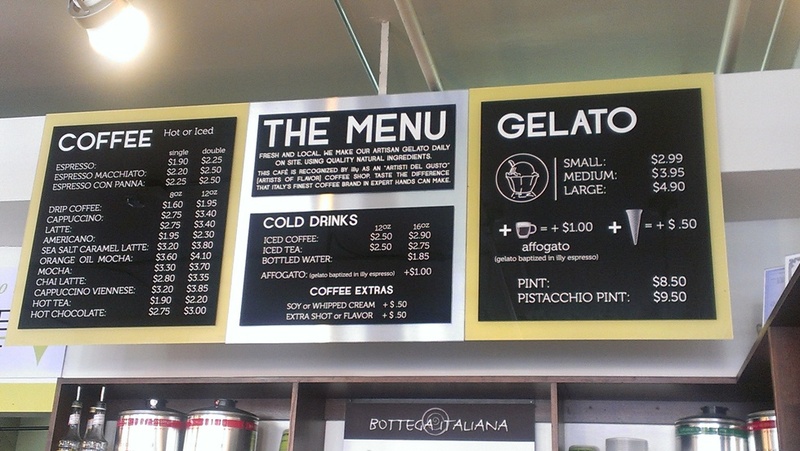 Unlike other gelato places, Bella Gelateria does not openly display their gelato. Instead, the gelato is kept in large metal cannisters with lids on them. Maybe this keeps it more fresh? I sampled the salted caramel, the chocolate and Belgian brownie and the limoncello cheesecake. I wanted to sample more but I was too embarrassed to ask and there were other customers haha… They were all very soft, creamy and flavourful but I ended up falling for the chocolate and Belgian brownie. I can’t seem to resist chocolate! I did find it to be pricey though at $5.50/scoop and a dollar more for a waffle cone but they do use high quality ingredients. It’s not somewhere that I can visit frequently and I am easily satisfied by other gelato options but you should at least try it once if you’re in the area! 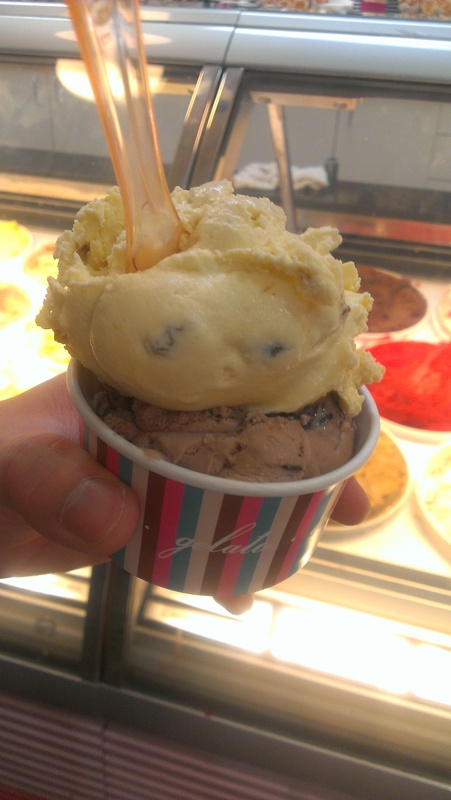 This entry was posted in Desserts, Food Reviews and tagged Bella Gelateria, gelato. 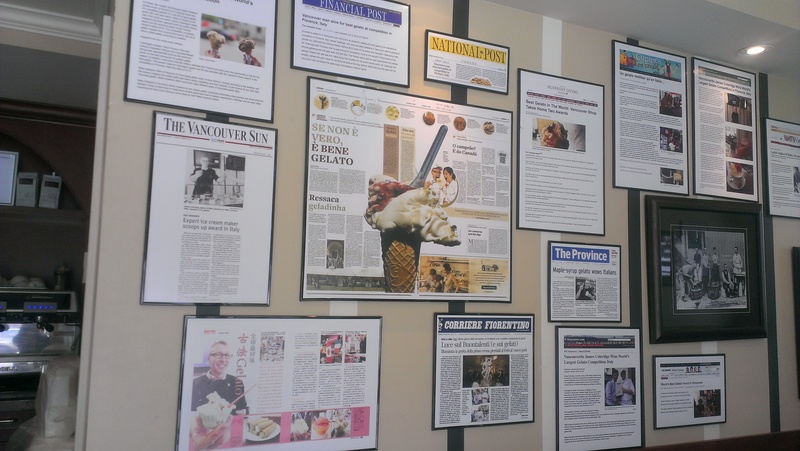 Froshberg Gelato opened at the newly renovated Richmond Centre food court last year. I tried it once but I forgot to take pictures so I haven’t blogged about it yet. Since I was quite impressed last time I had to go back and try some other flavours! I’ve sampled the matcha green tea, peach mango, lime and pistachio flavours and they were all very good so it was hard to decide on what to buy. I like the sorbet flavours because they have just the right about of tartness without losing the fruity flavours but it wasn’t icy either. This entry was posted in Desserts, Food Reviews and tagged donatella, Froshberg Gelato, gelato, tiramisu.